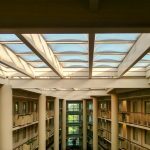 A Hilton Hotel Skylight Inspection and Certification. An onsite skylight survey and inspection was made on 2/22/2017 by Skylight Specialists, Inc., represented by Dan Packard. One (1) 4’ x 4’ (nominal) bronze acrylic pyramid skylight. Original skylights. Five (5) 76” diameter round, acrylic, skylights (dual glazed) clear over clear, replaced 2017. Curb Fasteners: Adequate interior mounted fasteners. Evaluation: Skylights are in acceptable condition and no work is needed. Two (2) 36’ x 38” skylights acrylic barrel vault. Bronze over clear (dual glazed) original skylight. Two (2) 76” diameter round, acrylic, skylights (dual glazed) bronze over clear. 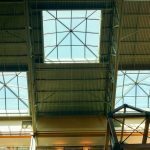 Evaluation: Skylights have crazing in the acrylic and are aged but not leaking and no work is needed, but replacement should be planned for in next 3-7 years. These are a serious fall hazard and not up to code. 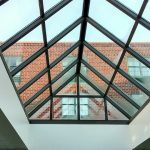 We recommend skylight replacement with fall-rated skylights, safety screens or installing barricades around the perimeter to prevent falls. Entry into Hilton fitness basement skylights – Acrylic barrel on top of glass wall. Clear over clear (dual glazed) original. Walkway between Hilton and office building skylights – Acrylic barrel on top of glass wall. Bronze over clear (dual glazed) original. Curbs: Standard curbs with adequate height and flashing. Glazing: Glass, tempered over tempered (dual glazed), bronze over clear, original. Fasteners: Adequate interior mounted fasteners. Those over the pool are showing signs of corrosion..
Curbs: Adequate height and flashing. Recommendation: Clean glass every spring after storm season and wet seal every 5-10 years. The glass skylights are starting to show their age and have damage on the metal. 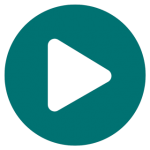 Our recommendation for replacement depends upon owner’s budget. 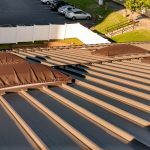 If not replaced, then the skylights need maintenance work including scraping off caulking, cleaning the glass, replacing failed glass and resealing the system. The glass is fogged on 6-10 panes. Two (2) 8’ by 8’ and one 5’ by 5’ polycarbonate pyramid skylights . Matte White over Matte White (dual glazed) replaced in 2004. One (1) 14’ by 16’ polycarbonate walkway. Matte White over Matte White (dual glazed) replaced in 2004. Porte Cochere – One (1) 38’ by 16’ polycarbonate walkway. Matte White over Matte White (dual glazed) replaced in 2004. Glazing: Quadwall polycarbonate, Matte White over Matte White. Evaluation: Skylights and walkways are in great condition and no is work needed, fall protected. 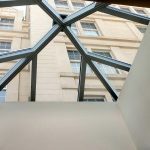 (Note: Do not apply any materials to these skylights—they do not require any sealants).